"I love both the Manual & Motorized Shake'n Rake, does what it was built to do, I'm a very satisfied no very ecstatic and happy customer"
"I was pleasantly surprised and how well made it was and how long the batteries lasted. For me it made the job a lot more pleasant." "OUTSTANDING TOOL for cleaning the sand in my chicken coop." "I bought this Shake'n Fork and it's a dream in my barn. I use cob bedding and it takes only moments to muck my stalls. " This sand sifting tool makes cleaning beaches and golf bunkers a breeze. The Shake'n Rake Sand Sifting Tool comes with a 1/4" mesh screened basket it's optimized for sifting sand in golf bunkers, beaches, resorts, playgrounds or backyards. It quickly separates glass, tar balls, cigarettes, tree bark and needles, animal waste, zebra mussel shells, bottle caps and other unwanted debris. Excellent for sand volleyball courts, baseball diamond screening and backyard chicken coop floor clean out. Recharger is included with the Shake'n Rake. Finally a sand sifting tool that cleans like magic! The Shake'n Rake Sand Sifting Tool comes equipped with a 1500 MaH high capacity battery pack - it will run for over an hour on one charge. (For longer run time, upgrade to the 2500Mah battery). Just squeeze the variable speed trigger and let the magic of the Shake'n Rake do the work of sifting sand for you. Equi-Tee auto-sifting Shake'n Rakes are the most cost effective way to sift sand, eliminating excess sand removal while separating unwanted debris for disposal. The integral motor efficiently sifts debris down to 1/4" with no manual agitation. 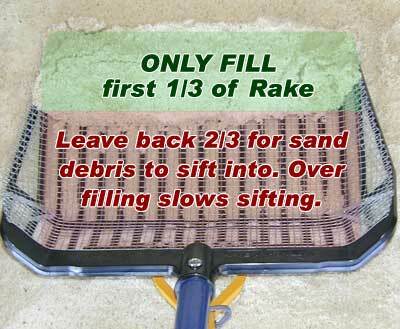 This sand rake has a durable fiberglass shaft with a comfortable ergonomic grip. Ideally the sand to be sifted should be dry. Using the optional 3/8 mesh screen, sifting damp sand is possible. With manual screened tools, it is difficult for damp sand to work through a screen, but the motorized action of the Shake'n Rake agitates the sand for you. It should not be used for wet sand or in the water. For the best results, use the 1/4" mesh screen only in dry sand. Customize your Shake'n Rake sand sifting tool options, like a super lightweight carbon fiber hand pole, extra capacity 2500 MaH battery pack or a 3/8" mesh screen size. The Shake'n Rake sand sifting rake is similar in appearance to a conventional screened rake, However, since it is powered it must be operated so that the sand can be sifted. This requires that the screen be only partially loaded so that there is room for the sand to move while the debris is being separated. Following the suggestions below will greatly improve the performance and lead to faster cleaning with far less effort. Use 1/4" mesh screen for dry sand. Use 3/8" mesh screen for damp sand. To sift sand efficiently, fill only the front 1/3 of the basket. This is the part of the basket that "Shakes". As it shakes, the debris will stay on the screen to be disposed of. Lift the Shake'n Rake off of the ground before starting the motor. When it is on the ground the screen is unable to sift. Pushing the tines into the sand when running will greatly decrease battery running time. Keep the rake flat, the debris will automatically move backwards to the belly. Use the slowest shaking speed that will sift effectively. It is not advised to completely fill the basket while running the motor at full speed. Unless the sand is totally dry, this may result in an overloaded condition causing slow sifting, shortened battery life and user fatigue. *Custom Secure Pack is a foam-in-place packaging material that assures that your package will arrive without shipping damage. ALL SHIPMENTS WILL BE DELIVERED USING UPS. Even though USPS is offered, there are no post office deliveries for this item, all orders will be switched to UPS. Equi-Tee Rakes are manufactured to the highest standards and our goal is to provide a reliable product. In the unlikely event that a problem arises when you start using your purchase, we have a warranty in place to cover those repairs, often at no cost. Warranted parts are required to be returned for inspection and the owner is responsible for shipping during this warranty period. If a part is found to be defective, we may issue a credit of up to $20.00 to cover shipping costs. This warranty does not cover normal wear and tear, or damage caused by use, abuse or accidents. It generally covers only defects in manufacture that are not related to wear. Since the warranty is date specific, it is important that you provide us with an original sales invoice. Any return for repair where we send a call tag for the return shipping requires that you re-package the unit in the original box, with the original supplied packaging. This is the only assurance that the products are not damaged during shipment. All returns for repair require a returned goods authorization (RGA) number to be affixed to the box prior to shipment. Please contact us at 541 826-8301 for this RGA number. At our discretion, we may repair, replace or refund the purchase price of the item. Commercial accounts are defined as any user with five or more horses. Every Equi-Tee Fork is warranted against defect in manufacture for all components for 90 days in residential use or 45 days in commercial use, from the date of purchase. An extended warranty period of 13 total months for residential use and 3 total months for commercial use is effect for the basket TINES against breakage. Warranted parts may be required to be returned for inspection and the owner is responsible for shipping during this warranty period. This warranty does not cover normal wear and tear, or damage caused by use or abuse. Most repairs after the warranty periods expire are due to normal wear and tear or accidents, but we can repair almost any item at a nominal cost. In some cases we may elect to offer an extended warranty, but we cannot determine this until we receive the product back for inspection. We have sold 1000's of these units and we know what is "normal" function and what is not and try to be fair with our determination. We are not liable for any other costs related to the failure of this product other than the purchase cost of the item. Our warranty is subject to change without notice. We honor the warranty in place at the time of purchase. If you purchase a fork/rake and upon receipt find it totally unsuitable, with prior approval you may return it for a full refund of the purchase, less any third party costs. Parts must be returned NEW and UNUSED. To prevent shipping damage they must be returned in the original box using the original packaging. They must be undamaged upon our receipt. We only offer a very limited return refund once an item has been used or damaged, so be sure that your fork/rake will function in your application before you purchase or use it. We will usually honor a return request, but if the item has been used and is not re-sellable, we will only offer a partial refund as described in this warranty description policy. Once we receive your item back, we will evaluate if any of the parts can be refurbished and adjust the refund according to that. We ONLY refund the original purchase price of the product as shown on an invoice. We do not refund shipping, Amazon, Ebay, or any other third party fees paid in connection with the purchase. Equi-Tee forks are manufactured to the highest standards and our goal is to provide a reliable product. In the unlikely event that a problem arises when you start using your purchase, we have a warranty in place to cover those repairs, often at no cost. Commercial accounts are defined as any user with five or more horses, or other services provided for a fee. Every Equi-Tee Fork is warranted against defect in manufacture for all components for 90 days in residential use or 45 days in commercial use, from the date of purchase. Components include the electric motor, gearbox, basket (excluding tines), handle-pole, grip and motor lever. An extended warranty period of 13 total months for residential use and 3 total months for commercial use is effect for the recharger, electronics, batteries. The basket TINES are warranted against breakage during this time. Warranted parts are required to be returned for inspection and the owner is responsible for shipping during this warranty period. This warranty does not cover normal wear and tear, or damage caused by use or abuse. After much searching I found the shake n rake and it has made my life easier since we decided to go with a beach theme in the backyard my only complaint is the mesh there needs to be smaller than 1/4 inch mesh I ended up adding my own 1/8 mesh and it works like a charm. Nice invention. Thank you shopping at Equi-Tee Manufacturing. Factory fulfillment means factory direct pricing! We can offer specials that are not available anywhere else. If you experience difficulties call us toll free at 800-447-4726. Create an account and log in by clicking on the "Sign in" button at the top, then select the desired product button. With our products being made in the USA quality is our #1 goal. Each item we produce goes through a rigorous quality control check process to ensure you are getting the best made product possible. Get detailed receipts from a real company. We accept PayPal and all major credit cards. Pay with confidence!